Two researchers with the Indian Institute of Science have developed tiny tweezers that can manipulate objects in fluids as small as an individual bacterium. In their paper published in the journal Science Robotics, Souvik Ghosh and Ambarish Ghosh describe their nanotweezers and how well they work. As the researchers note, one of the important goals in nanotechnology research is to create tools to manipulate extremely tiny objects, particularly those that exist in fluid. In this new effort, the researchers describe a unique new type of mobile nanotweezers (MNT) that is able to capture and release extremely tiny particles with unprecedented speed and spatial resolution, possibly opening the door to the development of applications such as lab-on-a-chip technology. The MNT combines features of plasmonic tweezers and microbots, and is shaped like a common screw—each is magnetic and has silver particles embedded on the outside of its body that cluster when exposed to light due to plasmonic properties. Each is a ferromagnetic nanostructure grown using electron beam evaporation of silicon dioxide. Control of the MNT is done using a directed magnetic field. When in action, the MNT spirals through a fluid until it reaches a target. Light is then applied to cause the silver particles to constrict, using their trapping force to hold onto a target. 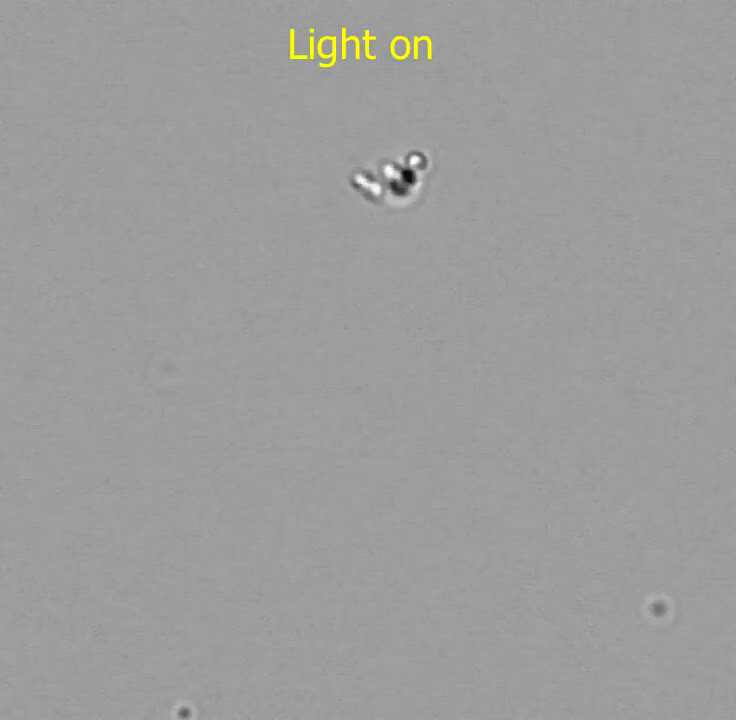 The MNT is then moved to a destination, whereupon the light source is turned off, relaxing the silver particles causing the MNT to release its target. The researchers demonstrated the abilities of their MNTs by moving around tiny diamonds, silica beads and samples of the Staphylococcus aureus bacteria. They note that testing also showed that the MNTs were able to grab objects without accidentally grabbing other nearby objects. 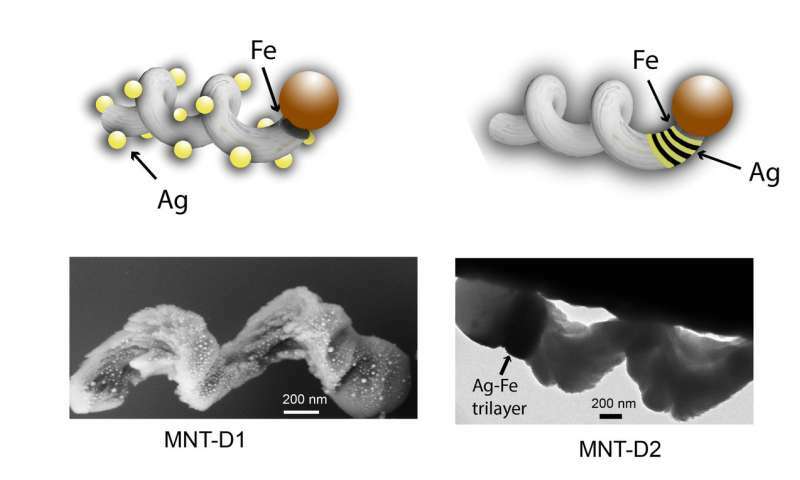 They suggest their MNTs could be used in nano-assembly applications. The researchers are continuing their work with the MNTs, looking to find ways to allow them to work in parallel (using multiple overlapping magnetic fields), which could broaden their usability in commercial applications by allowing hordes of them to work together to accomplish an overall task. An important goal in nanotechnology is to control and manipulate submicrometer objects in fluidic environments, for which optical traps based on strongly localized electromagnetic fields around plasmonic nanostructures can provide a promising solution. Conventional plasmonics based trapping occurs at predefined spots on the surface of a nanopatterned substrate and is severely speed-limited by the diffusion of colloidal objects into the trapping volume. As we demonstrate, these limitations can be overcome by integrating plasmonic nanostructures with magnetically driven helical microrobots and maneuvering the resultant mobile nanotweezers (MNTs) under optical illumination. These nanotweezers can be remotely maneuvered within the bulk fluid and temporarily stamped onto the microfluidic chamber surface. The working range of these MNTs matches that of state-of-the-art plasmonic tweezers and allows selective pickup, transport, release, and positioning of submicrometer objects with great speed and accuracy. The MNTs can be used in standard microfluidic chambers to manipulate one or many nano-objects in three dimensions and are applicable to a variety of materials, including bacteria and fluorescent nanodiamonds. MNTs may allow previously unknown capabilities in optical nanomanipulation by combining the strengths of two recent advances in nanotechnology.